RefShare provides the ability to allow users to share their RefWorks database or just specific folders from their RefWorks database with other users at the UofA or even publicly. Certain users may also have permission to post their folders or databases on the UofA shared page viewable by all UofA RefWorks Users. RefShare users have the ability to allow exporting, printing, generating a list of references and even using custom output styles at the folder or database level. Existing RefWorks users can export from a RefShared database or folder directly into their own RefWorks database. a User who can access the Shared Area Page for the UofA. You can share a folder or database by going to the Share tab. Next to each folder is aShare Folder button and at the top of the page is theShare Entire Database button. TheShared Folder Options page will allow you to set up various permissions for your RefShare Recipients. Determine what print, export and bibliography generation options your RefShare Recipients will have. Allow RefShare Recipients the ability topost comments to your shared references. Decide if you want to include in your shared folder or database anyRSS feeds currently in your RefWorks account. Share any files you have attached to your references. Note: Please do not share copyrighted material outside of the University of Arkansas. Turn your shared folder or database into an RSS feed for others to access via an RSS Feed Reader. Post your folder or database to the UofAShared Area Page. Generally, a RefShare recipient will receive an e-mail with a URL and some information on how to access a RefWorks User's folder or database. Clicking on the URL or copying and pasting it into your browser, will launch RefShare (you can also link directly to a specific reference. If you are off-campus, you may need to input the UofA Group Code. Once you are in RefShare, you may have access to either a folder of references or an entire database of references (which may be organized into folders). View -- if an entire RefWorks database has been shared, you will see a Folder option listed here. You will also see All References (which is the default view), MyList, and you may also see RefWorks Shared Area. Search -- the Search area has several options: Advanced Search and Lookup by Author, Descriptor or Periodical. Help -- access to online help. About This Database -- displays any description about the folder or database being shared, as well as any print, export or bibliography generating limitations established by the database owner. Language -- allows you to change the language RefShare is displayed in (this does not change the language of the references). E-mail RefShare Owner -- allows you to simply send an custom e-mail to the RefShare User who granted you access. The Search RefShare box, at the far right of the screen, allows you to enter a word to search the entire contents of the folder or database. You may also have the option to search file attachments if shared. Print -- allows you to select references and print the records in the bibliographic output style of your choice. You can also sort your selected records using the sort options at the right of the screen. Export -- allows you to export selected references to your own RefWorks account or in another export format available. Create Bibliography -- allows you to select references and print the records in the bibliographic output style of your choice. Sorting is determined by the output style you choose. Comments -- allows you to post and view comments to specific references. Attachments -- When you are looking at a list of references (from any view), you may see a paper clip near the view and edit links for that reference. The paper clip indicates that file attachments are stored in that particular reference. RSS Feeds -- You may also see an orange RSS icon near the RefShare logo. This indicates that the RefShare Owner has create a RSS feed of the folder or database. Simply copy the feed and paste it into any RSS feed reader to download references. Please note: the data owner can set limitations as to how many references are transmitted in the feed. Find it / OpenURL Resolver --You may also see Find it! links that may help you locate full text of references. 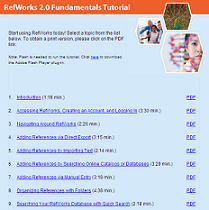 View the RefWorks help screens on sharing your references. << Previous: Using Find it!